Guest post by Courtney Doman, Digital Marketing Manager at Social: IRL sponsor, Spredfast. Originally posted in the Spredfast blog. 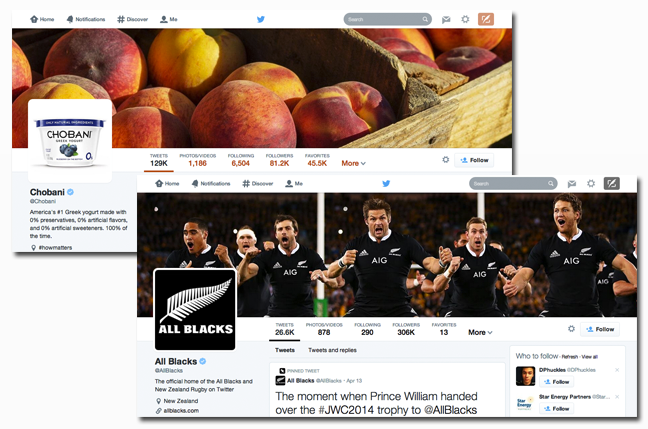 Twitter recently started rolling out its new look for desktop. Initial feedback is all over the map from high praise (“stunning visual format!”) to skepticism (“Haven’t I seen this before?”) It’s only natural to have an opinion about the new look, but getting hung up on specific changes is for the birds. Smart social marketers are already thinking about how to make the most out of their renovated real estate. The aspect ratio of you profile picture hasn’t changed; it’s still a square. But things are getting much bigger in the new layout. Upload a 400x400px image to ensure that your profile picture looks great in the timeline and the new larger format profile picture at the top right hand of your profile page. This frees up a broad swath at the top of your profile to share an image that tells your brand story. Look at the two different stories told by Chobani and the New Zealand All Blacks. Two very different, but equally compelling messages, conveyed with a single image. With (well over) 5,700 tweets per second being published every day on Twitter, it’s easy to wonder whether your brand’s message is being swept away in the mad currents of your followers’ Twitter streams. Now, if you have an important message to convey, you can pin a tweet to the top of your brand page so that it’s the first tweet a visitor will read. Quick tip: don’t use this space to introduce your brand- that’s what your bio is for. Use it to communicate timely information like details of an upcoming sale, a match or episode specific hashtag to enhance a second-screen experience, or an important cause your brand is supporting. Before rolling out these new desktop updates, Twitter announced social enhancements to photo sharing via mobile. You can share up to four images in a single tweet and tag up to ten people in a photo. All without taking up any more of those precious 140 characters. While these updates only affect mobile publishing, you can still view tweets with multiple pictures and photo tags from any device. How can your brand use these features? Think about events like new store openings, or tab your design department to create a diptych, triptych, or tetraptych (we had to google that last one) where each individual image, as well as the collective collage tells a story. Michelle Obama used this feature to share photos from her recent trip to China. While your brand may have an established presence and following on Twitter, remember that many of these changes have been motivated by Twitter’s desire to draw new users to the network. This is great for brands seeking to engage and invite more people to participate in their social community and experiences. Understand your audience and share content that will engage your community, new members and old alike. 76% in fact. These changes to the profile page currently only affect desktop views. Keep an eye out for how these updates may potentially impact mobile use, but for now, don’t take your eye of the ball in optimizing tweets for on-the-go consumption.